Good morning, Junkies and welcome to Day 7 of the 30 Days of Christmas inspiration. We will be bringing you creative holiday inspiration during October and into November. Today, for your viewing pleasure, I've created a Christmas card with an unexpected background. Using the P002 Bricks, Dark and P003 Bricks, Light background stamps with Stazon Midi ink in reds (St. Valentine and Claret, respectively), I created this background. I then sprayed the card with Sandcastle Colorations from Art Anthology to fill in the 'mortar' with the cream color. I wrote a bit of the poem from 'Twas the Night Before Christmas" in the mortar lines with a red pen. It says, "And laying his finger aside of his nose and giving a nod, up the chimney he rose." 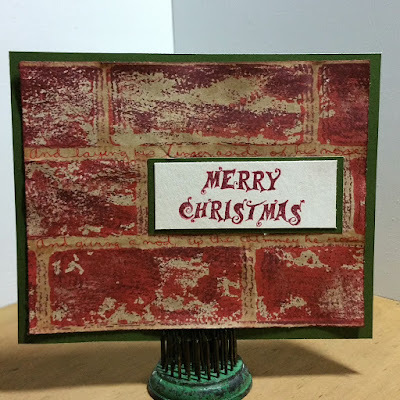 The sentiment is from the newly released SS046 Winter Wonderland Sayings sentiments stamp set, which I layered with cardstock to fit right inside a 'brick'. A nice card for the men in your life, for a new home owner or the brick masons! Remember that all of the Christmas stamps, including the one used here, are 20% off on www.techniquejunkies.com by using the work Christmas at checkout. I don't think it applies to the Bricks, but you can always contact Pat if you'd like to recreate this card for your Christmas cards!